I hope you realize by now, that Juan Valdez is or was a figment of your imagination, a totally fictional Columbian coffee farmer, appearing on American television back in 1959. I was still in junior high, and had no intentions of ever drinking coffee. This was the brainchild of the Federacion Nacional de Cafeteros and the ad agency, Doyle Dane Bernbach. Obviously, it was successful! As an FYI, Juan is now represented currently by Carlos Castenada. He has appeared in sombrero and sash, along with his faithful mule, Conchita, carrying sacks of fresh picked coffee beans from Columbia. His efforts came to symbolize the traditions of over 560,000 coffee growers or cafeteros. We plan to track the guy down, and make him tell us his coffee secret. But, while we are here, perhaps we can all learn a little more about the precious bean that we all adore every morning. 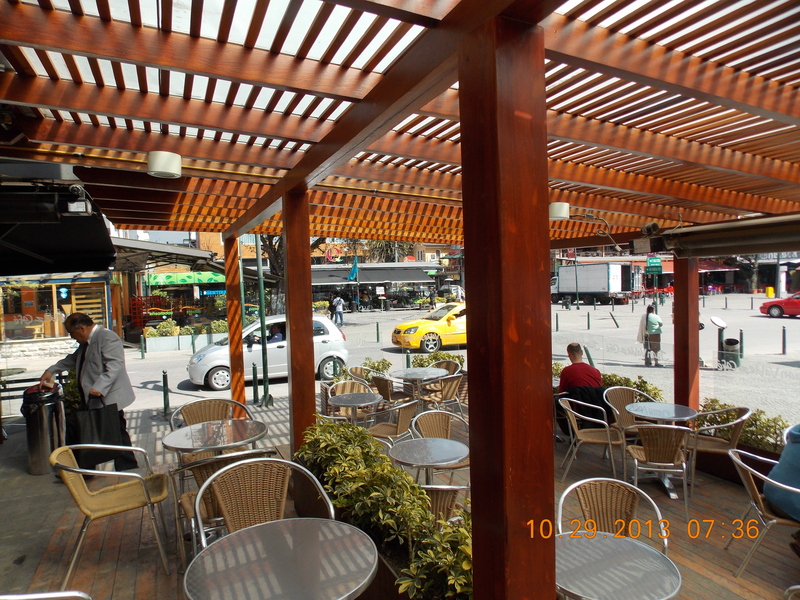 It is the Columbian highlands that are home to the prolific coffee production. I did learn however, that shade trees, as well as banana trees, fix the nitrogen in the soil. The 565,000 coffee farmers here in Columbia produce 12% of the world’s coffee, second only to neighboring Brazil. 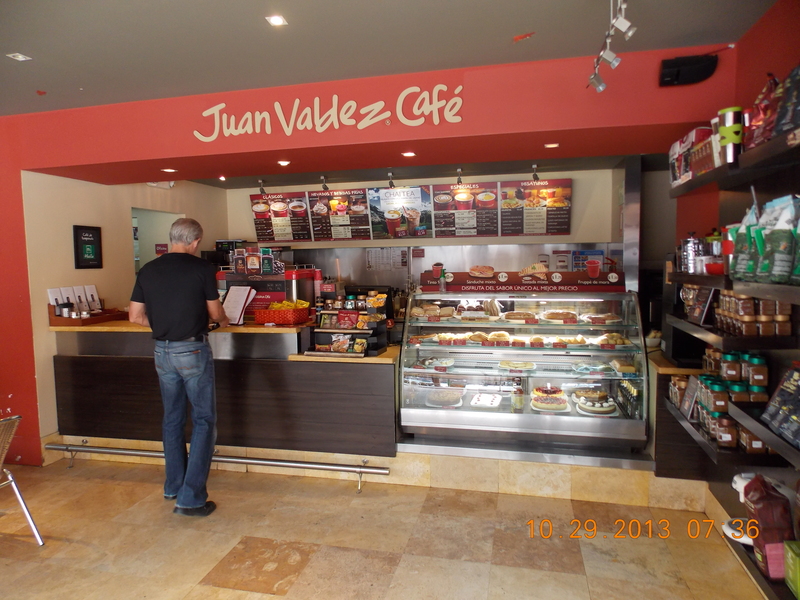 Mike and I found the nearest Juan Valdez Coffee place, just around the corner from our hotel. I had a latte’, and he had a cap. Coffee here is quite strong, so most people add milk, generally served warmed, with their morning black coffee. But contrary to what I thought, there is not a Juan or Starbucks on every corner. But the coffee is very good. As we wind our way to Columbia later in the week, we shall see if Juan is more ubiquitous there. So far, finding a good cup of coffee is hard to find. Coffee Arabica is the plant that grows best in well-drained soil at elevations of 2500 to 4000 feet, with constant temperatures between 59 and 82 degrees F. But despite the best laid plans, it still take four years for the bushes to begin fruiting. Once the beans turn blood-red, they are picked. The fleshy outer layer is removed, exposing the beans. The beans can be dried in the sun, or blow-dried, hopefully, without a hair dryer. Then the leathery skin is stripped away, leaving the bean that will be roasted, sorted, vacuum sealed and shipped to us! Bottom line, we plan to visit some of coffee’s hallowed places to get a first hand view of coffee.